There was a wonderful opinion piece in The New York Times a few weeks ago about the importance of recreational math. Now, as author Manil Suri said, I’m sure that to some people, the idea of recreational math sounds like an oxymoron. But it’s everywhere! From poker players calculating their odds based on the cards dealt to the number crunching in role-playing games in order to complete certain tasks (or develop a character’s skills), math is built into many recreational activities. It’s certainly a part of many kinds of puzzles, including brain teasers. 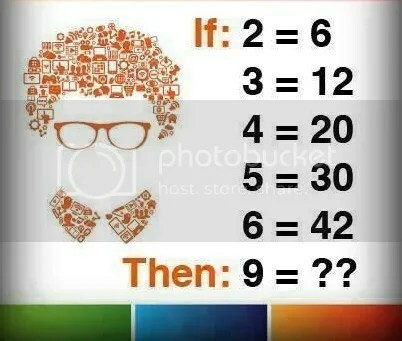 Heck, previous brain teasers featured here in the blog like Mystery Number, the Birthday Puzzle, and the jugs of water trap from Die Hard with a Vengeance would all easily fall under the umbrella of recreational math. 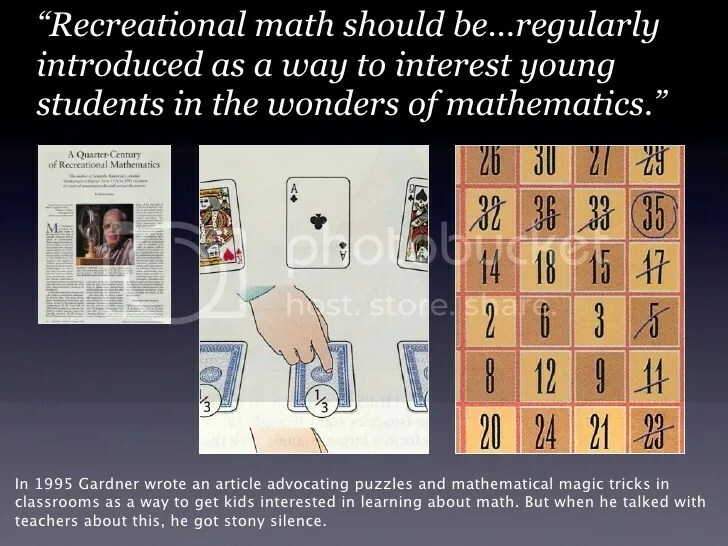 The article goes on to mention the wonderful work of Martin Gardner, whose column “Mathematical Games” in Scientific American was a mainstay of recreational math and puzzly whimsy for over twenty-five years. Indeed, a paper this year in the Journal of Humanistic Mathematics points out that recreational math can be used to awaken mathematics-related “joy,” “satisfaction,” “excitement” and “curiosity” in students, which the educational policies of several countries (including China, India, Finland, Sweden, England, Singapore and Japan) call for in writing. In contrast, the Common Core in the United States does not explicitly mention this emotional side of the subject, regarding mathematics only as a tool. This is an excellent counterpoint to the regular argument that the primary value of puzzle-solving and other activities (like recreational math) is to stave off brain health issues later in life. In a previous post, we discussed the inconsistent reports about the effects of puzzle-solving on the brain, leaving it unclear if regular doses of puzzles and recreational math are beneficial for other aspects of brain health over time, like memory retention, neuroplasticity, and concentration. That may well be the case, but Suri’s point stands. The idea of instilling a sense of fun and wonder into the field of math, especially for younger minds? That’s one worth pursuing. Show them that math can be about more than fulfilling homework or graphing parabola. Show them that mathematical concepts can help you crack a diabolical seesaw brain teaser, save a village with a grain of rice, or find an alternate solution to a PSAT question and prove the testers wrong. 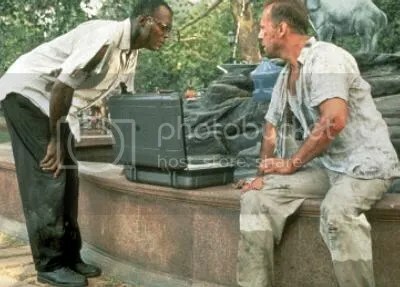 It has been championed in the past by television shows like Square One TV and MythBusters, but sadly, examples like that are few and far between. And if we can instill recreational math as a key facet of math itself, then we’d be one step closer to ensuring that STEM courses will have plenty of participants in the future. 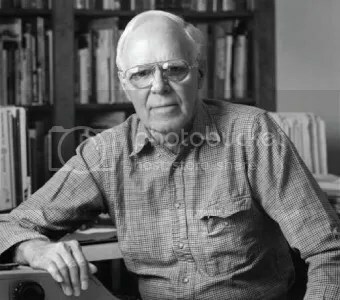 If you don’t know Martin Gardner, you absolutely should. For twenty-five years, he penned a column in Scientific American called Mathematical Games, adding a marvelous sense of puzzly spirit and whimsy to the field of mathematics, exploring everything from the works of M.C. Escher to visual puzzles like the mobius strip and tangrams. His affection for magic, puzzles, and mathematics was infectious, and events known as Gatherings 4 Gardner began springing up. After his passing on May 22, 2010, his legacy now lives on thanks to an annual global event known as the Martin Gardner Celebration of Mind. Magic tricks, puzzles, recreational math problems, and stories about Martin are shared by admirers and devotees, all in the hopes of maintaining and spreading the wonderful spirit of playful mathematical experimentation that Gardner embodied so brilliantly. So today, we here at PuzzleNation invite our fellow puzzle fiends and math lovers to join us in celebrating not only Martin’s life and love of all things mathy and puzzly, but the marvelous tradition of sharing those interests with others. 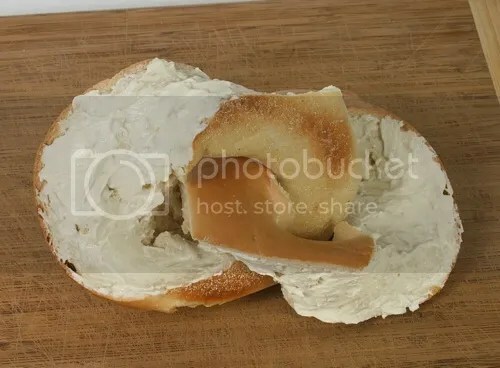 And in the spirit of sharing similar puzzle joy, I proudly give you our own little contribution… the mobius bagel.